Below some books I found interesting to read and used to make this site. Surface plasmon resonance (SPR) plays a dominant role in real-time interaction sensing of biomolecular binding events. This book focuses on a total system description including optics, fluidics and sensor surfaces. It covers all commercial SPR systems in the market. It is the first of its kind and fills a gap in the technical literature as no other handbook on SPR is currently available. The 2nd edition is a total revised and updated handbook and with a chapter written by the SPRpages. The final chapter discussed new trends and a vision is given for future developments and needs of the SPR market. This excellent handbook provides comprehensive information with easy to use, stand-alone chapters and will be of great use to anyone one working with or affiliated to the technology. Surface plasmon resonance (SPR) plays a dominant role in real-time interaction sensing of biomolecular binding events. Although the last decades have seen the birth of various books on sensors and biosensors with some mention of surface plasmon resonance, such a comprehensive work on SPR covering the issues relevant for the interested student or the practicing researcher has long been awaited. 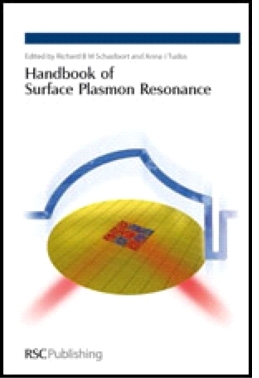 The Handbook of Surface Plasmon Resonance covers all relevant aspects of present technology spanning a bridge between theory, instrumentation and applications. The book provides a thorough theoretical introduction, including kinetic models of biomolecular interactions as well as a practical guide for assay development. The book describes the instrumentation of SPR in terms of optics, fluidics, surface chemistries and kinetics with an easy-to-follow guide of how to use the technique providing relevant applications. The history of SPR, new trends, and a vision of future developments and needs of the SPR market are given. The potential of SPR is revealed by showing highly exciting and unique opportunities for unraveling the functional relationships of complex biological processes. The book is a comprehensive source of information with easy to use, stand-alone chapters, and will be essential for scientists in industry and academia working with or affiliated to the technology. Intended for a wide audience, The Handbook of Surface Plasmon Resonance is also students aspiring to use the technology, and the wide public interested in SPR as a phenomenon and in its applications. Springer 2015, ca. 183 p.
his book addresses the important physical phenomenon of Surface Plasmon Resonance or Surface Plasmon Polaritons in thin metal films, a phenomenon which is exploited in the design of a large variety of physico-chemical optical sensors. In this treatment, crucial materials aspects for design and optimization of SPR sensors are investigated and outlined in detail. The text covers the selection of nanometer thin metal films, ranging from free-electron to the platinum type conductors, along with their combination with a large variety of dielectric substrate materials, and associated individual layer and opto-geometric arrangements. Furthermore, as-yet hardly explored SPR features of selected metal–metal and metal–dielectric super lattices are included in this report. Nagata, K. & Handa, H.
General introduction to surface plasmon resonance and the Biacore system and some basics of the experimental procedure. Greater part consist of the applications with SPR and Biacore. Applications are explaned by real experiments and data analysis and contain a reference list. Cass, T. & Ligles, F.S. This book describes in detail key methods for immobilization of biomolecules and cells on a variety of surfaces with different geometries and chemistries so that they retain their function. Also included are the analytical techniques needed to measure the functionality of immobilized biomolecules. The book is divided into three parts. Part I introduces readers to the fundamental principles of surface plasmon resonance (bio)sensors and covers the electromagnetic theory of surface plasmons, the theory of SPR sensors and molecular interactions at sensor surfaces. Part II presents a review of the state of the art in the development of SPR sensor instrumentation and functionalization methods. Part III discusses applications of SPR biosensors for study of molecules and their interactions and detection of chemical and biological analytes related to environmental monitoring, food safety and security and medical diagnostics. Surface Plasmon Resonance Methods and protocols. Springer 2010, X, 255p, 77 illustrations., 6 in color. Provides detailed protocols for a wide variety of SPR applications. Includes comprehensive background information on SPR techniques for better experimental design. Examines a variety of coupling techniques on different sensor surfaces. Highlights background issues involved in SPR assays to avoid common errors frequently found in SPR literature. Presents protocols in clear step by step procedures including the basics of kinetic analysis. Focuses on a wide range of applications for membrane-bound protein interactions, including G protein-coupled receptors. Chapters on the combination of SPR with mass spectrometry (SPR-MS) for quantification and identification of proteins. Written for users of commercially available SPR equipment. Covers the two most common sources of deviation from ideal kinetics: mass transport and surface heterogeneity. This book offers a pratical guide to the principles of quatitative analysis in biological experiments. Topics covered range from the basics, such as measuring the concentrations of macromolecules, through considerations of binding constants and the kinetics of molecular interactions. Complimenting the material presented in the book is a collection of Web-based simulations, available at the CFH site, that can be manipulated to visualize important concepts presented in the chapters. They afford a better understanding of binding and rate curves and fitting data. Editors, Erica Golemis and Peter Adams, Cold Spring Harbor Laboratory Press.